Heat oven to 350°F. In medium bowl, stir 1/2 cup butter and the egg until blended. Stir in cookie mix until soft dough forms. Stir in pecans. Onto ungreased cookie sheets, drop dough by rounded tablespoonfuls about 3 inches apart. Bake 8 minutes. 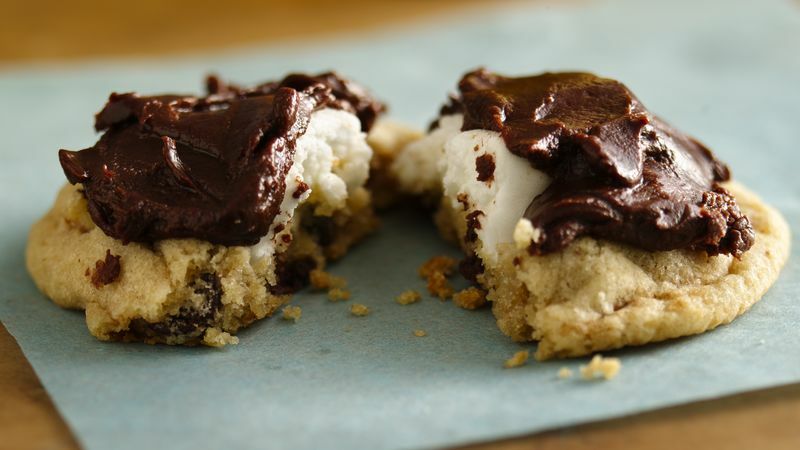 Remove from oven; immediately press marshmallow half lightly, cut side down, on top of each cookie. Bake 1 to 2 minutes longer or just until marshmallows begin to soften. Cool 2 minutes; remove from cookie sheets to cooling racks. Cool completely, about 15 minutes. Meanwhile, in medium microwavable bowl, microwave chocolate chips uncovered on High about 1 minute, stirring until smooth. Add whipping cream, 1 teaspoon butter and the vanilla; blend well. Stir in powdered sugar until smooth.